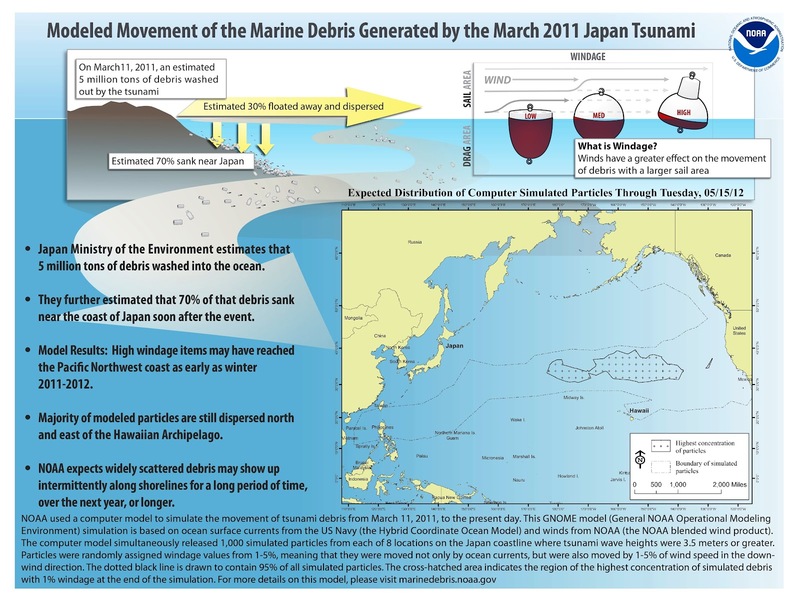 The powerful Japanese earthquake and resulting tsunami in March, 2011, washed untold tons of marine debris into the Pacific Ocean. This video explains what NOAA is doing to help track the debris. John Anderson, a plumber by trade and a beachcomber by passion, has been trolling the shores of the Olympic Peninsula in Washington State for more than three decades, and along the way has discovered almost every kind of flotsam one can imagine: toys, refrigerators, even the occasional message in a bottle. But in recent months, Mr. Anderson has been making a new, and somewhat surprising, find: dozens of buoys marked with Japanese writing, set adrift, he believes, by last year’s catastrophic tsunami. “That wave wiped out whole towns, I’m thinking just about anything could show up here,” said Mr. Anderson, 58, of Forks, Wash. The tsunami — which struck after a massive offshore earthquake last March 11 — sent a wall of water sweeping across much of Japan’s eastern coastline and generated more than 20 million tons of debris, a jumbled mass of houses, cars, boats and belongings. And while it’s not clear what percentage of that wreckage was sucked back out to sea and what remains afloat, what is certain is that some of it is slowly making its way to American shores. On the first anniversary of the Great Tohoku Earthquake, IPRC's Senior Scientist Nikolai Maximenko speaks about the current status of the tsunami debris that the earthquake generated. Computer models run by the National Oceanic and Atmospheric Administration and by researchers from the University of Hawaii predict that debris has moved eastward from the coast of Japan, driven by currents and wind. The models predict that bits of detritus will begin washing up on the northwestern Hawaiian Islands this spring and along the western coast of the United States and Canada in early 2013. “We don’t think there is a massive debris field out there,” said Nancy Wallace, director of NOAA’s Marine Debris Program. Researchers think most of it will never reach shore and will instead get caught up and broken apart in the “great Pacific garbage patch” a swirling gyre of currents in the middle of the Pacific Ocean known to collect and recirculate floating garbage. But beachcombers say the debris has already begun to reach land. “I feel like Paul Revere running through town, saying ‘The British are coming!’ and no lights are coming on,” said a retired oceanographer, Curtis Ebbesmeyer. Co-author of “Flotsametrics and the Floating World: How One Man’s Obsession With Runaway Sneakers and Rubber Ducks Revolutionized Ocean Science,” Mr. Ebbesmeyer, 69, also publishes Beachcombers’ Alert, a newsletter on all things flotsam and jetsam. He counts some 10,000 people in the loose-knit network of serious beachcombers who read his newsletter and report their seashore findings to him. Mr. Ebbesmeyer said he had received more than 400 documented sightings of large black plastic and white Styrofoam buoys found between Kodiak, Alaska, and Humboldt County, Calif. Many of the buoys are marked with Japanese characters, including the names of oyster companies destroyed by the tsunami. The buoys corroborate computer modeling by Mr. Ebbesmeyer and an oceanographer colleague that predicted debris would begin landing as early as last fall. After the earthquake and subsequent tsunami that struck Japan on March 11, 2011, tons of debris was swept into the Pacific. Much of it is buoyant enough to float on the surface and can be moved around by small scale currents and large scale circulation patterns, such as the North Pacific Gyre. The gyre, bounded by the Kuroshio Current on the west, California Current on the east, and Equatorial Current on the south tends to entrain debris in the center of the Pacific basin, creating what is commonly known as the "Great Pacific Garbage Patch." Though the bulk of the marine debris remains in the ocean for years in an area north of Hawaii, individual pieces are continually washing up on the continental and island shores that border the basin. NOAA's Marine Debris Program leads efforts to track and remove much of this existing trash, and is currently assessing the tsunami debris. Scientists as NOAA's Earths System Research Laboratory developed the debris dispersion model, shown here. Using five years of historical weather patterns, the model is used to approximate how debris will circulate across the basin. Despite a rise in interest and reported sightings, officials have not confirmed that any of the items found along the West Coast originated in Japan. “There is debris from Asia that comes to shore all the time, and it’s not necessary tsunami-related,” Ms. Wallace said. Thus far, only two tsunami debris clusters have been confirmed, a wrecked Japanese fishing boat spotted by a Russian ship that was en route from Honolulu to Vladivostok, Russia, and another vessel located by the United States Coast Guard nearer to Japan. Finding flotsam over some 5,000 miles of open ocean is not easy. A month after the disaster, the debris was no longer visible in NOAA’s satellite images. To assist in the search, officials have requested higher-resolution satellite images from the National Geospatial-Intelligence Agency, which runs satellite-based mapping and monitoring for the Defense Department. In recent months, NOAA reached out to the commercial shipping and fishing groups, asking boats to report any large debris sightings in the water. NOAA has also called on a growing cadre of beachcombers to keep a lookout. Since January, the number of e-mails NOAA has received reporting tsunami debris has increased threefold. The Web page answering frequently asked questions about the tsunami gets more visitors than any of the program’s other pages. NOAA also has a smartphone app for tracking debris found on beaches. Whether tsunami-related or not, officials encourage beachgoers to pick up and properly dispose of any garbage they find. “Radioactivity is extremely unlikely,” Ms. Wallace said, in part because the damaged Fukushima reactor did not begin leaking radioactive material until after the tsunami wave retreated. Tom Baty, an avid fisherman and a retiree, spends up to three hours a day walking the beaches of Point Reyes National Seashore in California, where he picks up trash and sometimes tracks the location of plastic debris with a GPS device. Mr. Baty, 54, regularly finds tidbits of junk marked with Japanese, Chinese and Korean characters, which makes him skeptical of the reports of tsunami debris up the West Coast. Still, he said he was curiously awaiting the arrival of any floating evidence of that violent event. Mr. Baty is one of a ragtag army of unofficial seaside detectives who provide useful information on the patterns and whereabouts of ocean garbage to government officials and environmental groups.